Is this Brisbane’s best private venue balcony? Is this Brisbane’s best private balcony? We certainly think so. 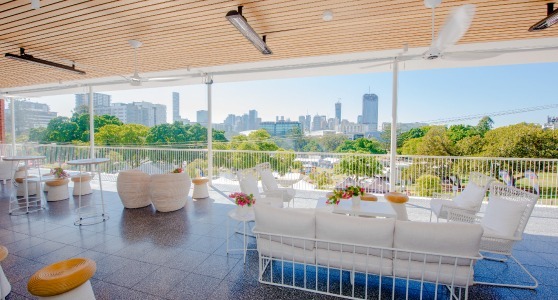 With sweeping views of the lush green parklands and city skyline, modern terrazzo floors and timber feature ceiling, The Greek Club’s new Grand Balcony is one of Brisbane’s most stylish event spaces. With a signature cocktail from the balcony’s private bar, it’s easy to picture yourself far off in the Mediterranean, from right here in South Brisbane. The Grand Balcony connects to The Greek Club’s renowned Grand Ballroom and is just one of the new event spaces to come out of the venue’s recent $3 million refurbishment. Whether you’re planning a corporate business event or a private function, the Grand Balcony is the perfect space to suit any occasion for up to 100 guests seated or 180 standing. We’ve put together some fresh ideas on how this exciting new space can be utilised. A decadent 3-course modern Australian menu, a deluxe beverage package and the picturesque views of Brisbane at night – these are the makings of the ultimate corporate dinner event on the Grand Balcony. Use this exclusive space to delight your clients, celebrate your team’s hard work or as the perfect setting for a break-out event from a local business conference. The Greek Club is located just a short walk from the Brisbane Convention & Exhibition Centre and we would be delighted to host your break-out event while you’re in town for a convention or trade show. Whether it’s a private celebration, launch event or corporate soiree, cocktail events are truly special on our Grand Balcony. Indulge in either modern Australian or authentic Greek catering options from our brand-new cocktail menu. With the end of financial year (EOFY) fast approaching, it’s almost time to crack the bubbly and toast to the year that was. This space is also perfect for Christmas party functions, and it’s never too early to start planning for the festive season. Ask our dedicated Events Manager about The Greek Club’s cocktail events styling package to take your function to the next level. If you’re utilising the Grand Ballroom for a conference or seminar, the adjoining balcony makes the perfect break-out space for your event. Rotating small groups through various workshops or activities can work wonderfully for staff training events, and what better way to get a team motivated than an activity on the stunning Grand Balcony. The open space lends itself to a variety of unique workshops and team building ideas. Why not try a health and wellness session with a spot of yoga! This function space also acts as the ideal pre-dinner drinks venue for larger events utilising the Grand Ballroom. Delight your wedding guests with arrival cocktails overlooking the city skyline before they enter your beautiful reception. Or offer your guests champagne and canapes on the Grand Balcony before your gala dinner function or university ball. However you decide to use this fantastic new event space, your guests are sure to be impressed by this beautiful setting. To start planning your next Brisbane function or to arrange a private venue tour, contact our dedicated events team today via phone on 3844 1166 or via email at info@thegreekclub.com.au. You can also submit an online enquiry HERE.